So I got some great advice based on my last post on becoming a boy mom. Most often mentioned? Yes, that's right folks. 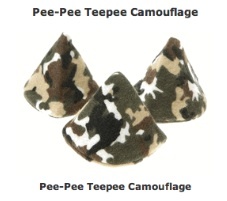 Introducing the camouflage Pee Pee Teepee. Why do I love this so much? Because Rambo loves everything camouflage. So, what can we infer from this information ladies and gentlemen? Rambo is going to LOVE to change diapers! I so wish I knew about these when my Milo was a baby (he's almost 9 now). One time he managed to pee OVER my head. The stream missed me and landed on my open laptop that was behind me on the sofa. LOL Try explaining that one to the computer repair guy!